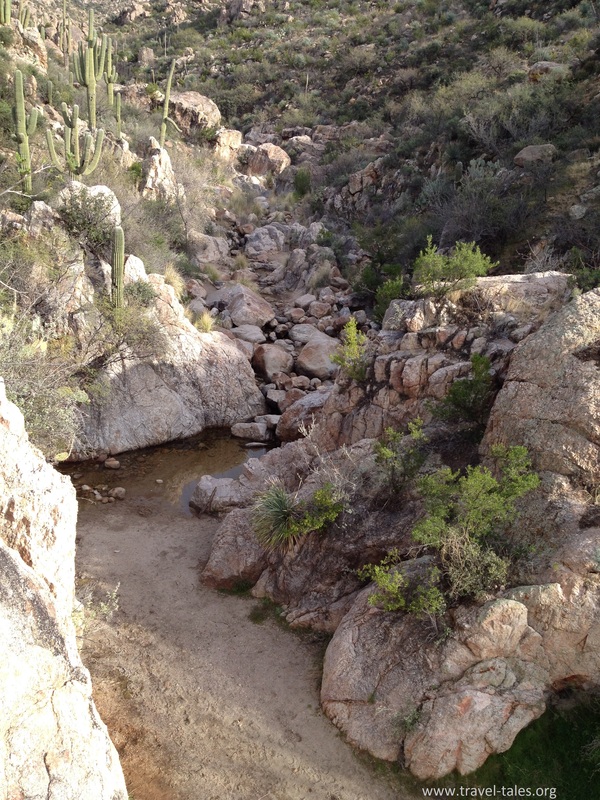 Catalina State Park is between the Biosphere 2 and Tucson. Having enjoyed my hike in Picacho Peak State Park, I decided to explore this one too. As I was by myself this time, I chose to stick to trails designated as ‘easy’ because there wasn’t anyone to help me if I was to get into trouble. The first trail I chose was the Romero Ruins Trail, a short 0.75 mile loop through some ruins of buildings built by multiple occupants at different times. The Hohokam had a village here from about 500 AD, and there is evidence from midden dumps of earlier settlement too. The most recent occupant, Mr Romero has given the trail its name and his farm house is the only one distinguishable to the untrained eye of this unlikely-to-be-archaeologist! The second trail I walked was the Canyon Loop Trail in the anti-clockwise direction. The trail crosses a wash on three occasions. My first crossing had water, the second was in sight of the last of the water and the third was completely dry. I took a quick side-step along the first half mile of the Romero Canyon Trail to visit the Montrose Pools while on the Canyon Loop Trail, so apologies to anyone expecting me to be unveiling a lido in central Houston….